One unique thing about Mark Palermo was that he knew every street in Chicago. No, I don’t mean he knew all the major streets; he knew every single street in every part of the city. Whenever I came across a street that was new to me, I would quiz him the next time I saw him: “Hey Mark, do you know where Clover Street is?” Mark would reply something like this: “Yes, Clover Street is 4614 West and runs from 4000 North to 4068 North.” You see, when Mark was growing up, his dad worked for the post office and Mark would pour over city postal maps, using his photographic memory to amass knowledge of Chicago streets that few others, if any, ever have. On August 10, Chicago lost the person with this amazing bit of knowledge…the Chicago Public School System lost one of its dedicated former teachers…and the Presbyterian Church (USA) lost one of its most faithful members with an incredible record of service… when Mark Alan Palermo died suddenly of a heart attack at his Chicago home. He was 62. Mark grew up in the Roseland Presbyterian Church on Chicago’s south side. In 1976, when his family moved to the south suburbs, he was one of the founders of the Orland Park Presbyterian Church, and served as Clerk of Session. He was also a member of the Presbytery of Chicago’s Church & Society Committee where he underwent a trans-formation that led him to develop a strong concern for social justice. “I was really very naïve when I was first on that committee,” Mark said. “My eyes were opened to the needs of marginalized people on the fringes of society.” In 1983, at the age of 30, Mark became the Moderator of the Presbytery, the youngest person ever to be so elected. 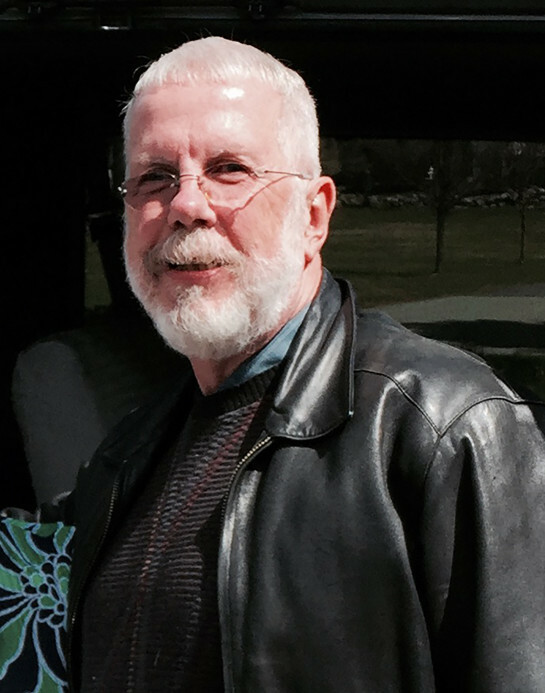 Mark later became a member of Lincoln Park Presbyterian Church (LPPC) in Chicago (1988-2001), and at Fourth Presbyterian Church in Chicago (2001-2015). From 1994 until his retirement in 2008, Mark served as Senn’s attendance coordinator where he maintained records for 1,500 students, worked with high-risk students to resolve truancy issues, and acted as a liaison to provide services to 70 homeless students. For a time, Mark was President of Senn’s Parent Teacher Student Association. Mark would also save up his vacation days, and with his principal’s permission, take off the last one or two weeks of every school year to attend the Presbyterian national General Assembly. Despite his busy schedule with the school system, for many years Mark worked on Saturdays at a hardware store in Roseland. Although I remember Mark as a fellow church member during the years he attended LPPC, my most vivid memories of him are from our involvement together in the More Light movement within the Presbyterian Church. Mark was truly one of the pioneers of this movement. In 1977, Mark was a commissioner to the General Assembly and there met LPPC’s David Sindt (the founder of the Presbyterian Gay Caucus in 1974) and other early leaders of the fledgling effort to promote the inclusion and full membership rights of LGBTQ Presbyterians. Mark was moved by what he experienced and felt he could no longer be silent about the exclusion of and discrimination against people on the basis of their sexual orientation. I actually first met Mark in the early 1980s when the Chicago chapter of what was then called Presbyterians for Lesbian/Gay Concerns (PLGC) held its monthly meetings at LPPC, at that time, the only Presbyterian congregation in Chicago that would host such a group. Mark held many leadership positions within PLGC over the years. He was the long-time local treasurer, helped organize the PLGC Midwinter Conference held at LPPC in 1985, and coordinated the monthly fellowship dinners for many years which were crucial for “being church” and providing mutual support. Nationally, he served on the PLGC Executive Board from 1986-1992, and on the organizing committee for the More Light Churches Network, which was founded in 1992 at the More Light Churches Conference held at LPPC. During all this time, Mark was known for his caring and wisdom in counseling many LGBTQ people who were struggling to find their place in the church. He faithfully worked for the day when all of Christ’s sisters and brothers would be welcomed fully and joyfully into the Presbyterian Church. That is why I am so glad that Mark was able to join the gathering in April at Stony Point, NY for the Rock Stars and Prophets Conference which included many of the early leaders of the More Light movement. The purpose of the conference was to celebrate our victories in ordination rights and marriage equality that have become reality in our denomination, and to tell our stories to a new generation of leaders, as well as to work to preserve the history of this remarkable movement. Mark was interviewed at the conference and you can see that short video at tamfs.org/interviews. 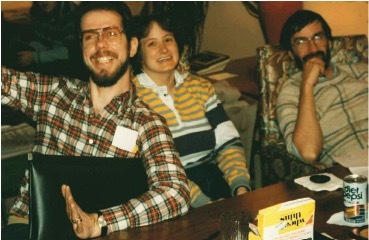 Mark Palermo (left) with former LPPC Seminary Assistant Lisa Bove, and David Sindt, at a PLGC Chicago meeting, 1985. 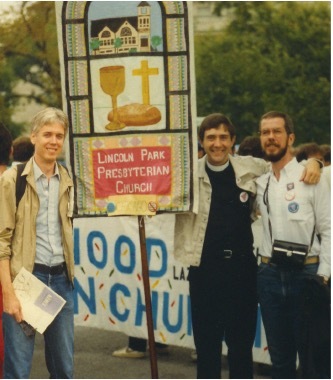 Barry Smith, former LPPC Parish Associate Stuart Smith, and Mark Palermo (right) proudly carrying the LPPC Banner at the March on Washington for Lesbian/Gay Rights, 1987. Mark was always an on-the-go guy. In addition to all his regular commitments, he enjoyed travel, concerts, theater, local history, and trying new restaurants with friends. In retirement, he spent summers in Chicago and winters in Palm Springs, CA. His many friendships across so many constituencies are a testament to his character and the values he held and lived. Although it is sad that Mark left us earlier than we would have hoped, he packed more living into his 62 years than many of us would be able to do in twice as much time. Mark was preceded in death by his mother, Phyllis (2014), and his partner, John Klein (1991). He is survived by his father, Emil, and his sister, Eileen Boehler, both of Rockford, IL, and many other relatives and friends. A memorial service was held in Rockford on September 12, and another service will be held at Lincoln Park Presbyterian Church on October 3. Mark’s ashes will be interred at the Desert Memorial Park in Cathedral City, CA. A guestbook to share your memories of Mark is on line at legacy.com. You can download “In Memoriam: Mark Alan Palermo, 1952 – 2015” in its original formatting for inserts or printing. Thank you, Barry. See more on the Interviews page. Dear Friends, I am saddened to share the news that Mark left this world on August 10, 2015. Many of us renewed ties with Mark or met him for the first time at our Stony Point Center gathering in April, Rock Stars and Prophets: Generations of Justice and Love. Many of us also knew Mark from his early work with PGC/PLGC; More Light Churches Network, and the eventual formation of More Light Presbyterians​. He was one of the original rock stars and prophets of the movement in the Presbyterian Church (USA) for equality and full-welcoming of our Lesbian, Gay, Bisexual, Transgender, Questioning and Queer (LGBTQ) community. We are so grateful to him, as we are to all who walked with and since Mark in the gospel we share. With all our hearts, especially in this time of sadness, we celebrate Mark’s life with our love and remembrances. We extend our condolences to Mark’s family and one another, with the prayers and love of a community of thousands. A community whose lives are better today because of the time Mark spent with us on this planet. We welcome his presence and guidance from his new “residence” and invite those who might like to hear his interview from April, to do so below. We send Mark forth with our love and gratitude from this broad family of ours, into the next realm of the God who loves us – here and beyond here. Thanks to our friend Steve Madden of Steve Madden Shoes!